Grid 3 software is the industry gold standard when it comes to environmental control units for disabled individuals and communications devices for quadriplegics. No disability or debilitating disease is alike, which is why it is best to customize any type of adaptive equipment for quadriplegics. Accessibility Services, Inc. (ASI) not only customizes our products to fit the needs of each individual, but we also equip our products with the powerful Grid 3 software. Grid 3 software is truly revolutionary, as it is the first complete software solution that truly caters to the quadriplegic. Assistive technologies have historically not been the most user friendly for quadriplegics, but the Grid 3 definitively changes that! The autonoME (both an environmental control unit and a speech generating device) powered by Grid 3 is one of the few communication devices for quadriplegics that offers a plethora of voice selections that can be tailored to belong to the user. Environmental control units for disabled individuals are sometime lacking in features. The autonoME equipped with the powerful Grid 3 software allows for full control of the environment, including lights, beds, doors, television, telephone, nurse and/or caregiver call and more! 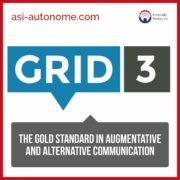 Customize your autonoME even further by downloading your favorite grid sets!! Part two will cover additional Grid 3 software features including accessible tools and apps, input methods, and computer control.